Trainers and sport scientists that we partner with have asked us about the science behind Athos. We decided to leverage the knowledge of our research team and coaches to breakdown what Athos measures and how. In this first of many microblogs covering Athos Science, we’ll break down what we mean by muscular stress and how we use sEMG to measure it. In this overview, we will learn from Coach Garrett Nelson, founder and Strength and Conditioning Coach at Victory Athletics. Garrett was an early adopter of the Athos Training System and has a wealth of knowledge on what it’s measuring and how to apply Athos sEMG to his coaching decisions. As a Strength and Conditioning Coach, I’ve spent a lot of time researching and experimenting with what the best tools are for sports performance. I’ve also spent a lot of time trying to understand important insights and training variables and how I can leverage them to keep my athletes healthy and performing and practicing at their best. When I was introduced to Athos, I was really excited to be able to get my athletes in the gear and run quick experiments as well as increase my understanding of how each of their bodies worked to produce movement. This ability combined with metrics such as measuring internal muscular stress, muscular ratios, sequencing patterns, and acute to chronic ratios allows me to measure, adjust, and re-evaluate training programs constantly. On top of that, having real time biofeedback has proven extremely helpful and, honestly, fun. Everyone wants to see their biceps turn red when they start flexing! To provide all of this data, Athos leverages (sEMG) technology. 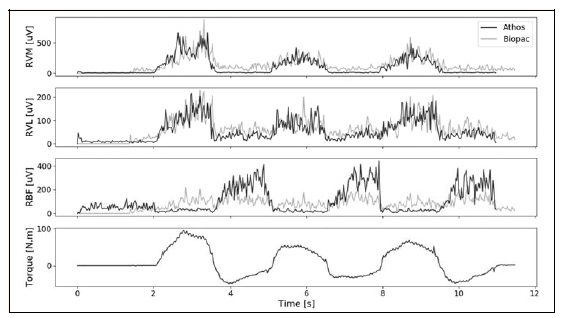 sEMG is a tool typically used by researchers and clinicians to better understand how a given task or skill is accomplished by the body through the measurement of electrical activity. We use sEMG like Athos to help us understand and estimate overall stress because of the proven relationships that sEMG has with other variables. With Athos, when we use the term “stress” we refer to a general definition meaning pressure or tension exerted on the physical and physiological systems of the body. During training and sport, the neuromuscular system causes the production of force across muscle groups to support and overcome the load and demands on the athlete. Physical Stress refers to the mechanical tension and the structural breakdown of muscle, typically from force production. This can be estimated by understanding the correlation between sEMG and force production (positive correlation - more sEMG, more force). By wearing the gear during a weight room session, I can better understand: relative muscular contributions, training balance and asymmetries (left to right, anterior to posterior, etc), and an estimate of how much each muscle group was used during the session. 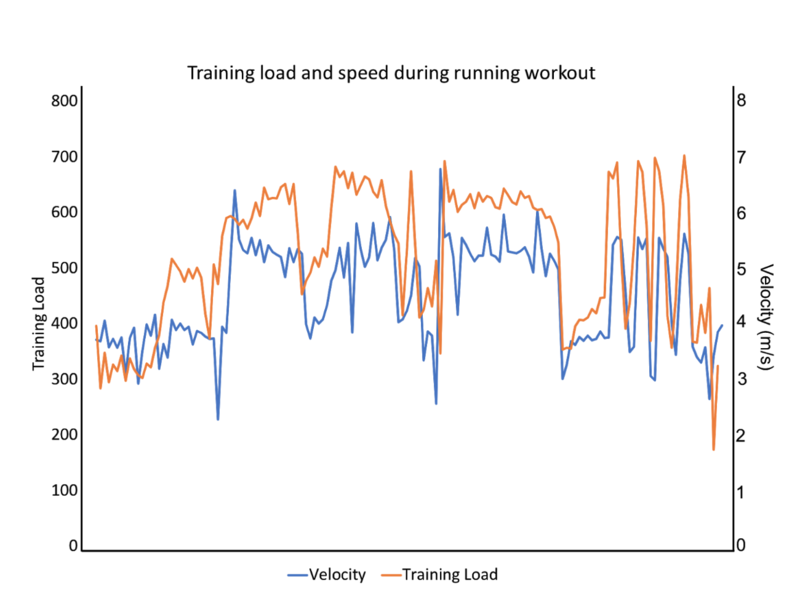 By analyzing these variables, Athos can be used to plan volume loads, track imbalances, intent, and help us understand if and when an athlete is doing too much or too little. This has implications throughout the competitive season, from preparing during the off season, to tapering pre-season, to maintaining ability in season, to recovering in the off season. The more data we accumulate, the more effective and individualized each program can become. Metabolic stress refers to the use of the energy available to the body, both locally (in the muscle) and systemically (stored and released into the bloodstream). This can be estimated by understanding the relationship between sEMG, fatigue, lactate buildup (fuel consumption and repletion), heart rate, and an understanding of both local muscular level and general systemic use of energy. For example, the longer my sessions are (on field or in the weight room), the more my muscles are used, the higher chance of using up more fuel and having some level of metabolic distress. The body’s energy systems take time to restore and Athos can help us understand not only how much rest time we should take, but also if we need to increase our post training nutrition dependent on the upcoming schedule. If I could know early in the game that my star player’s energy levels would not sustain him to take a game winning shot, you had better believe I’m finding a way to help him replete and recover enough to have him on court when we need him the most. The neurological system, in this sense, refers to the ability to produce skill and muscular function properly. Neurological stress is produced by all activities, with high velocity, high force, and high skill activities taxing the system more than general movements (imagine a squat vs. a pitcher throwing a baseball). This can be estimated by seeing greater sEMG activity to produce the same or a lesser outcome for a given task, and can be measured both acutely - within a day or a session - and chronically over time. Both cases require rest to help reduce fatigue and restore or increase performance, and the time needed is dependent on how deep the fatigue hole has been dug. As an acute example, if a starting pitcher’s motor pattern and workload is too high in the 6th inning, now I have the opportunity to do something about it and make a more informed managerial decision. As a chronic example, if my star reliever has thrown several days in a row and isn’t showing the same physiological patterning, now I can think logically about whether it is a good idea to put him in or let him rest. Example figures demonstrating how these components fit together to cause a muscle to produce force. Could combine this into a body infographic view. Athos helps us to better understand what is happening to our athletes in training. It takes the guesswork out of potential causes of decreased performance and can even be used to help predict injuries (relating to pattern changes due to fatigue, ACR, muscle breakdown, ect.) before the injuries can take athletes off the field. Athos helps us prepare, by knowing if and when to push, and when to back down. As well as what demands our athletes need to be ready for day in and day out during the season. Athos helps us analyze our data and programs at a group and individual level, keying in on the metrics that matter most to us. It also creates a history that shows changes over time and helps create better plans moving forward with an athlete. Gone are the days of amassing questionnaires, RPE, and tracked volume loads. Now we have a real-time resource in Athos that helps us to make better decisions, faster. Carroll T. J. Recovery of central and peripheral neuromuscular fatigue after exercise. J Appl Physiol 2016.